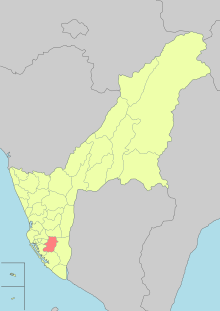 Fengshan District (traditional Chinese: 鳳山區; simplified Chinese: 凤山区; Hanyu Pinyin: Fèngshān Qū; Tongyong Pinyin: Fòngshan Cyu; Pe̍h-ōe-jī: Hōng-soaⁿ-khu) is a district located in southern Kaohsiung, Taiwan. Fengshan is one of the administrative centers of Kaohsiung and is home to the Chinese Military Academy. There are three military units currently located in Fengshan. Both Chinese Military Academy and R.O.C. Army Infantry School were migrated from mainland China and re-established here in 1950. Chung Cheng Armed Forces Preparatory School was established in 1976. These three units used to be the main economic driving force, but their importance seems to diminish gradually as Fengshan has established itself as a conjunction between Pingtung City and Kaohsiung. Although there are several industrial zones at the rim or outskirt of the city, the major life style in Fengshan seems to be very residential. Lots of apartments were built near the proximity of Kaohsiung city center as a result of shifting economic weight. 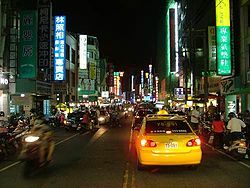 Like most of areas in Taiwan, it also has many night markets scattered around within the city. Most of the night markets run until 2:00 am. Some of them run business on different days of a week, but some others are all year round. Some of them are temporary, while others have become permanent establishments. During the Dutch era, the current location of Fengshan was called Pongsoya (see Linbian, Pingtung), a group of eight Makatao villages and one of the most populous areas of Taiwan. During Qing rule, Fengshan District (Formosa) [zh] included areas south of Tainan (then called "Taiwan-fu") and west of the mountains. In 1875, the southern part of Fengshan County was separated into Hengchun District [zh]. In 1901, during Japanese rule, Hōzan Chō (Japanese: 鳳山廳) was one of twenty local administrative offices established. According to the 1904 census, Hozan town had a population of 5,750, whereas Hozan District had a population 173,016. In 1909, this unit was merged into Tainan Chō (臺南廳). From 1920 to 1945, under the prefecture system, Hōzan Town (鳳山街) was administered under Hōzan District, Takao Prefecture. After the colonial government started to develop Takao Harbor in the early 20th century, the importance of Fengshan was declining. 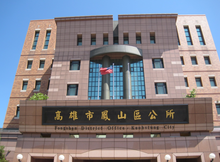 Fengshan was the capital of Kaohsiung County, established in 1945 as an urban township. 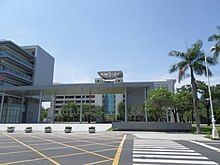 It was upgraded to a county-controlled city on 1 July 1972, and has been a city seat of Kaohsiung City since 25 December 2010 along with Lingya District. The district consists of Xiankou, Chenggong, Guangming, Xingzhong, Nanxing, Hede, Fenggang, Zhonghe, Zhenbei, Xianya, Wenying, Zhenxi, Zhentung, Beiding, Zhongzheng, Zhennan, Laoye, Ruizhu, Zhongyi, Chengyi, Xinxing, Haiguang, Zhongcheng, Xinjia, Wuhan, Zhengyi, Yijia, Fuxing, Tungmen, Ruixing, Tianxing, Xinjiang, Guotai, Fengtung, Xinfu, Guoguang, Guolong, Wende, Guobei, Caogong, Xingren, Wufu, Zhongxiao, Shengming, Hexing, Xiehe, Wenshan, Fucheng, Chengde, Sanmin, Beimen, Fujia, Nancheng, Wenhua, Dade, Wusong, Wenheng, Wenfu, Chengxin, Chengzhi, Guofu, Wuqing, Haiyang, Xinwu, Xinle, Xintai, Zhonglun, Zhongrong, Zhongmin, Erjia, Longcheng, Furong, Shanmei, Nanhe, Fuxiang and Baoan Village. Fengshan is in the tropical zone. Average temperature is 23 °C. Average precipitation is 1,500 to 2,000 millimeters. ^ "Administrative Districts". Kaohsiung Municipal Government. 30 September 2016. Retrieved 4 April 2017. ^ Takekoshi (1907), p. 199-200. Wikimedia Commons has media related to Fongshan District, Kaohsiung. Note: Although Hanyu Pinyin is the national standard, the Kaohsiung Government names its districts based on Tongyong Pinyin.